The government said Sunday it will kick off a detailed probe into the fires that affected vehicles made by German luxury carmaker BMW, with civilian experts allowed to join the effort. 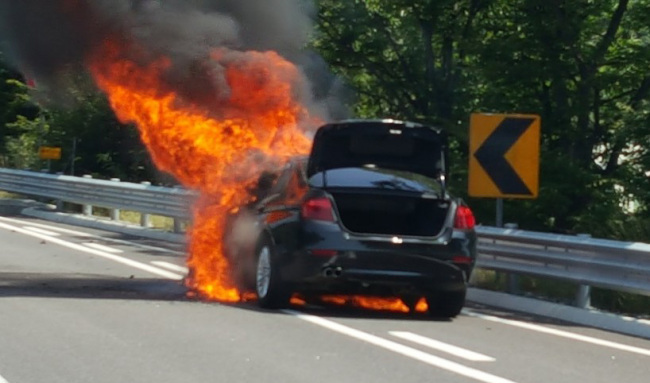 The move comes after BMW last month announced it will voluntarily recall 106,317 vehicles to fix a faulty component that may be causing fires in the engine area of 42 different models. The company said it already checked 15,337 vehicles, with a further 36,606 cars on its waiting list. A total of 32 cars made by the German company caught fire in South Korea this year, with the latest occurring Saturday. The carmaker identified the exhaust gas recirculation system, one of the principal methods used to reduce nitrogen oxide emissions from diesel engines, as the main cause of the recent fires in the engine compartment of its 520d sedan that run on diesel fuel. Authorities said that 18 vehicles that caught fire so far were the very popular 520d models. "Normally the state-run Korea Transportation Safety Authority is solely responsible for determining the cause of car-related problems but in light the seriousness of this incident, Seoul plans to permit outside experts to take part in the probe that ensures transparency," a transport ministry official said. He said that officials have received technical data evaluating the incident from BMW and will look into the information thoroughly. He, however, made clear that the investigation will start from a zero base without any preconceived ideas, especially since BMW cars that run on gasoline have caught fire as well. Both the transport ministry and the German carmaker have taken flak for responding too slowly to a critical safety risk to local drivers. The government even asked owners of the BMW cars to refrain from driving them but conceded there is no legal way to keep such cars off the road.